Join leading orthopedic surgeon Dr. Denis Marcellin-Little from U.C. Davis Veterinary Medical Teaching Hospital on this episode of Tripawd Talk Radio to learn about the implication and use of internal and external prosthetics and other othotic devices for three legged dogs and cats. What is the difference between internal and external prostheses? What complication can arise when using prosthetics for cats and dogs? Is your amputee pet a candidate? How much rehab is involved when using orthotic devices? What about 3D Printing? In most cases, the pet has already had an amputation and that’s too bad because the proper use of prosthetics requires planning ahead, planning ahead of amputation. It also requires an investment of both money and time necessary for proper rehab and training. In short, there’s an awful lot to consider when it comes to using orthotic devices for amputee animals. That is why we are honored to have a very special guest retuning to the show today. Dr. Denis Marcellin-Little is a leading expert in small animal orthopedic surgery, now teaching at the UC Davis School of Veterinary Medicine. He is here with us to answer frequently asked questions about artificial limbs for pets. Welcome to the show doctor and thank you for joining us again. Dr. Denis Marcellin-Little: Thank you. Rene Agredano: Hi doctor. This is Rene. Thank you so much for being here. Dr. M-L: Hello again Rene. I’m delighted to be back. Thank you for your hospitality. Looking forward to the show. Rene: Yes! Thank you. Well, we didn’t even get to really touch on this subject last time you were on Tripawd Talk. So this is a big topic and you are the best person to discuss it with us. So I really, really appreciate it. I would love to hear more about what you’re doing at Davis right now and what you’ve done in the past about helping animals live better with artificial limbs. Dr. M-L: Well, I’m delighted to talk about this. I always request that we don’t discuss that in us, including among veterinarians. We as veterinarians generally don’t learn a lot about prosthetics during vet school. So I would generally not expect veterinarian or my veterinarians to be very knowledgeable about it. Knowledge arrived a little bit randomly. Unfortunately there is not enough discussion quite yet about artificial limbs. So we will have the opportunity to discuss things in detail during this program. I want everybody to imagine that there are two very different types of prosthetics if you want. There are prosthetics that are removable. We call them exo-prosthetics. Exo-prosthetics means external prosthetics or outside prosthetics, meaning that it’s just something that’s placed around a body part and then we have endo-prosthetics or transdermal prosthetics, which are prosthetics that are secured to the bone and come out of the skin through a little bit of a hole if you want. The skin is connected around them and then there is a little piece of metal that goes out and is connected to another piece of metal or to the foot that connects to the ground. Very few people do the kind of prosthetics that are attached to the bone, the transdermal osseo-integrated prosthesis. They’re called osseo-integrated because the bone often grows into them and so the transdermal also integrated prosthetics are – they are rare. I will talk a bit more about them. I have been doing a few of those over time, over the last 10 years or so. I have some perspective on them and I can discuss their features and the process and why it’s so unusual at this point. The other prosthetic that maybe the kind of more importance for us to discuss is just the traditional exo-prosthesis or prostheses that are placed around the limbs and it’s also a little bit of a different universe that we can discuss further. Rene: Oh my gosh. I am so excited about this. I do find that it is true that the conversation about artificial limbs does not happen a whole lot in normal veterinary medicine with a family vet who’s about to amputate a dog or cat’s leg. Most people don’t even know that it can be an option until they see something on YouTube and they might see a dog trying to take his first steps with the external limbs that you described. As far as the implants go, I know you’ve made some pretty big headlines with your work in that area. So I would like to discuss that first because it’s really fascinating and it seems so futuristic but the reality is that the future is here and you were doing them. So let’s talk about this. You mentioned it’s called osseointegration. Can you tell us more about that? Dr. M-L: Yes. So osseointegration is something that is used routinely for total joint replacement. It has been happening over the last maybe 60 years or so. The first osseointegration was kind of discovered when bone was placed in contact with a porous metal and then the bone will grow into the porous metal and can become very solidly attached for life. Basically bones can grow into a textured metal surface and be permanently connected to it. We use osseointegration in total joint replacement routinely and we trust it and if you would supply it the right way, it can be very safe and very successful over the long term. So a bit later, maybe in the 1980s, there was a human medical doctor in Sweden that decided to – his father actually – the doctors in Sweden, the father was one of the inventors of dental implants that are stabilized with osseointegration and his son, an orthopedic surgeon, wanted to apply that to bone. So the [Indiscernible] group in Sweden developed transdermal osseo-integrated implants for humans in the 1980s in Sweden and it’s not a very popular surgery, not done very often. Their rehabilitation takes more than a year. It actually takes several surgical procedures or at least two. One, to implant a little piece of titanium inside the femur and then the second one to attach something later on after the bone has grown into the titanium. It’s not something that is kind of compatible with companion animals to wait a year like that and have multiple surgeries. So back – around 2005, our group at NC State decided to kind of push transdermal osseointegration forward by doing implants that resembled a little bit more what we were doing in total joints, implants that would provide immediate stability and we started with patients that had lost or missing two limbs because they were at a great disadvantage. Being two-legged is a really, really big problem compared to being three-legged. So we work with patients who are missing both of their back feet early on, cats and dogs, and we developed a technique to do transdermal osteointegration using implants that were customized to the patient bone, bone shape, bone surface, bone size and we need dogs and cats and back legs and front legs. So they are obviously – it’s a complex process where we would do a CT scan and then design an implant and then 3D print that implant. Again, adapt it to the bone that we work with and we can’t replace an entire limb. In fact you will hear the same thing in a few minutes when we discuss socket prosthesis. You can never really replace it completely. That’s very impossible at this point. You can replace lower portions of limbs. So we do a much better job with missing feet, maybe missing bone below the knee and belong the elbow. But if the elbow or the knee are missing at this point, it’s very unlikely that we would get a device be osteo-integrated or external that will work well. So we always want to save as much bone as possible if we’re planning the use of any kind of prosthetics because nothing works better than what you had in the first place. So osteointegration is basically the placement of these implants in contact with the bone. We reconstruct the tissue around it and we develop little [0:09:31] [Indiscernible] that are connected to these prosthetics, sometimes with little failsafe device. We call those mechanical fuse, which are basically little zones that break before the bone breaks. So it protects the implant bone interface and that’s transdermal osseointegration for you. It’s still an investigated procedure. It’s costly. It’s complicated. It’s not for everyone. It requires kind of bandage change and close attention to the interface between the skin and the metal. But I have one that has been around in a cat for nine years. That’s a happy cat there up in Ohio that has done well for nine years. Dr. M-L: It has greatly improved his life and we’ve had our share of complications, like everyone. So there have been about four, five groups that have done transdermal osseo-integrated implants, kind of evolving a bit independently and using different strategies and our group is – has done surgery. We’ve evaluated some aspect of it and we still think it’s not ready for primetime. It’s very complex and should be limited to only a few patients at this stage. Rene: Right. I know that it’s definitely not something that everyone is asking about. But when it does make headlines, it just seems like such an awesome possibility. Just about a week ago, we had a Tripawd member whose dog was diagnosed with osteosarcoma two years ago. He lost a leg to that. Well, the bone cancer came back in one of his remaining limbs and it was an opposing limb. So the individual decided to go ahead with the amputation on the next leg. The dog is a smaller breed. He’s some kind of bulldog mix. But he’s doing pretty well. I mean he’s getting around on two legs. But if the possibility for her to do an implant was there, I’m sure she would have taken it. Rene: It just seems like that’s the perfect dog for this kind of thing. Now, it is a big commitment, right? I mean it’s like you are in it for the long haul. Tell me what people and pets are the best candidates that you look for when you’re going to attempt something like this. Dr. M-L: Well, we would look at a situation where maybe – I think there are medical factors and there are dog factors and there are dog and owner factors in maybe identifying candidates for it. So I will go over that pretty quickly. Medical factors, we would probably want to have a fair prognosis. You know, you don’t want to be having a patient that has other comorbidities, other problems or problem with a terrible prognosis. You know, maybe you have a tumor and your chest also has a lot of tumor and the odds of survival are low and so therefore, maybe it’s not the wisest thing to invest all that time and money into something that might even not come to fruition because we won’t be ready for surgery by the time their lungs will stop working or the heart. We need to have a basic health if you want and a certain prognosis and there are ways when we have cancer to check that – whether there is cancer in other parts of the body. You know, a bone scan for example might tell us if other parts of the body already have cancer or the bones or the long bones and that might be a wise thing to do. We also want maybe to have – to be reasonably healthy altogether, healthy kidneys, healthy heart, healthy head. You know, good eyes. You know, to have some dogs that are not going to be too compromised. Otherwise, osseointegration makes less sense. The patient has to be reasonably well-socialized. We’re going to have to do a lot of bandage changes. We’re going to have to do a lot of training. We expect the dogs that kind of follow instruction and behave reasonably well. Otherwise, we’re probably going to be in trouble. Then the owner has to be obviously part of the team that is going to make that successful. Maybe an owner that’s willing to change bandages or be taught how to change bandages. An owner that follow instructions for activity that can communicate effectively if we have a problem, so we don’t get into a situation where somebody actually feels unable or unwilling to manage the surgery after or like we discussed, we may need to trim the hair at the junction with the metal, check it daily, disinfect it. Maybe wrap it in a certain way and not everyone is willing or able to do that for the rest of the dog’s life. Rene: And that’s a huge commitment it seems. It seems like you’re – I’ve heard somebody refer to it as you’re married to the vet team for that whole experience. Dr. M-L: Well, I haven’t seen – it’s all like depending on how fortunate you might be. You know, these things are – will have a range of complications. So we’re going to make sure that – and there will be complications that are associated with the procedure itself. You could have a bone that breaks and that might require some major endeavor to try to save the situation. You also could have a problem with the prosthetic foot. That is quite common and you may need new parts. They are little modular feet and so you may need a new part. You may need a new mechanical fuse, a new sole. I had a transdermal implant in a dog from New Jersey or spent time in New Jersey and in Florida and he would walk about four miles a day and he was kind of dragging his foot a little bit, an Akita, and he would drag his foot and he would go through – beginning we would make formed feet and the foot would wear down in about one day. Every day, we’re going to have to do a new foot for that dog. We were so delighted he was using his legs so well and everybody was very happy. But we had to kind of actually design a slightly different foot that well, you could go buy a shoe in a sport store, a dog shoe and then the little dog bootie would actually serve as a foot for our prosthetic limb. So that was kind of an interesting strategy to take care of this minor complication, if you want, of having – needing a maintenance team to make things for the dog on a very regular basis. But you say – you mentioned that you have to be kind of paying attention. Most people pay attention to their dogs anyway and interact with their dogs. You have to kind of channel your energy in a certain way. But everything you say about paying attention to the dog is also going to apply to an exo-prosthesis or socket prosthesis. Dr. M-L: So if you have a prosthesis that you place on a dog, you really have to check the skin every day, the device every day, maintain the device, replace the portions that are wearing down, fine-tune things. So the same amount of attention really will be required regardless of the device that will be used for the dog. So it’s not a huge disadvantage from the transdermal osseointegration to the exo-prosthesis. They all kind of require the same amount of work I think. Rene: That’s a really good point. I hadn’t thought about it like that. As far as the implants, do you think that there will ever come a time when they totally replace the need for amputation or even the exo-prosthetics? Do you think that will be the main thing that surgeons do? Dr. M-L: I think there are a range of emerging options in orthopedics that will potentially eliminate the need to do amputations and they include – just like if we imagine an artificial ankle and foot, an artificial wrist and hand. Someday I think we will do artificial portions of bones above like an artificial arm and shoulder or an artificial hip and femur. So I think the combination – I think the solution maybe to eliminate the need for amputation comes from 3D printing implant. Whether they stick out of the skin or not, for other parts of the limbs, they are going to be all internal and so that’s something that I’ve been very interested in for a while and I’m focusing on is to actually create these 3D-printed prosthesis that are able to either connect with a commercial implant for a total knee or total hip and actually replace the larger missing portion of a limb. So I think the combination of all these solutions as they become faster to prepare and cheaper to make and easier to implant, that is – hopefully will be eliminating the need for amputation in the future. We’re not quite ready with all these things because they are still slow and expensive and complex. They are – we’re getting closer I would say, but we are a number of years away from having these options. Again, one or two or three people doing those things is very different from having access to it wherever you are around the country and around the world. It takes a long time for us to do things well for the first time and then to teach everyone to do those things takes more time. Rene: Right, right. Well, we certainly appreciate that you’re trying to get us all there because if tripods ever goes away because of technology like what you’re describing and practices like that, I will be so happy. I never want to see another animal live without a leg because they can be happy, but they do – there’s a price to pay and so I’m grateful that you’re working on things like this. Let’s talk about the external prosthetics now. I understand you’re doing 3D printing for the implants. Are you 3D printing the external prosthetics as well too? Dr. M-L: Sometimes we will 3D print parts. I am doing some work to try to maybe simplify some aspects or optimize some aspects of this prosthetic device. There is a lot of opportunity for miscommunication and the planning and then the design of this device is a little bit left at the mercy of individual fabricators, if you want, around the country. Everybody has a different philosophy about what’s needed. So I’m very interested in understanding success and failures if you want and trying to improve the communication and precision along the way, to try to kind of have better outcomes for patients. Sometimes we 3D print the foot itself or the residual limb, so we can have a more faithful representation of the leg and we can do that using multi-materials. So you have a soft tissue, if you want, that is also rubbery and then you have hard bones in it. So that can – while this is kind of interesting for big dogs, it’s particularly helpful for small dogs because casting – the conventional method to start an exo-prosthesis is to make a cast and the casts of a little dog or cat are going to be very inaccurate in the big scheme of things. You know, the error will be more important in small patients than in big patients. So we can use 3D printing to replicate limbs based on CT scans. We can 3D print portions of prosthesis. You could 3D print an entire prosthesis, but it wouldn’t be cost-effective. The materials tend to be weak with polymer 3D printing. There are lots of newer technologies that are printing nylon and Kevlar and glass-filled nylon that are much more sturdy, but the conventional materials are more affordable. It’s not important to 3D print. What’s important is to actually work and have comprehensive strategies about what the device should have. What kind of contact surface will it have? What kind of hinges should be in it? How is it going to be attached to the body? What kind of straps are we going to use? What kind of foot or sole or material are we going to use, that will contact the ground? All these things have to be kind of worked out. Unfortunately, it’s very hard for veterinarians without specialized training to make this decision because it’s hard to find that information. Rene: I’m so glad you’ve discussed this because I know that people get really excited when a headline about a dog with a 3D-printed limb pops up and we see a video of a limb that some high school kids made on their 3D printer at school and it’s all very heartwarming and we love to see the dogs running around. But there’s so much more to that picture and that’s why it’s so important for people to work with someone who understands, who has what limited information there is available for prosthetic limbs, to create the limb for the animal and not just go with the kid down the street who has access to a printer. Rene: Yeah. So let’s talk about this. Which amputee pets are good candidates for any kind of prosthetic limb, external prosthetic limb? Does size or age play a role in their ability to adapt? Dr. M-L: The most important factor would be how much residual limb they have. If they have two healthy joints, like a shoulder and an elbow or a hip and a knee, then they are probably OK. The more limbs they have, the more predictably successful a device will be if they have an ankle and they’re missing everything below the ankle. We see partial amputations for tumors of the digits or the toes or the toenails and soft tissue problems, sarcoma distally. Then those are great candidate for devices. Maybe a tumor around the ankle or the wrists will also work reasonably well. Anything above becomes more and more challenging. Anything above the knee and elbow makes it nearly impossible. The same thing as what we discussed earlier. Maybe having a bit of a laidback personality, well-socialized, obedient dog. Not too crazy. Might work in our best interest in this situation and an owner that’s kind of a troubleshooting owner, that will pay attention to details and follow instructions and interact effectively with the medical team will help with the success also. Rene: There’s a lot to consider there. So really it’s – what it comes down to is the longer the limb that’s left, the better and the decision needs to be made obviously before the surgery. Is there ever any hope of somebody who comes to you and has already done the surgery but doesn’t have two joints left, maybe just one? Do you ever get a prosthetic to work on those patients? Dr. M-L: No, I don’t think so. Rene: That’s like cut to the chase like right there. Boom. Dr. M-L: Oh, yeah. I think – so you show up and you don’t have an elbow. Even if you bring an enormous amount of money and energy to the process, I mean short of doing very sophisticated transdermal implants with the kind of a computerized elbow, just like you have computerized knees. They would work similarly that are used in people that don’t have a knee. You would really be unfortunately not a candidate for a prosthesis. Same thing if you are missing the knee and you just had the femur. It would be impossible to have an effective device and you could put something – wrap the leg in something that it won’t be of any functional use. Dr. M-L: But if you had a tumor at the top of your leg, then you should have a discussion about limb sparing to save that leg. Again, it would depend on what is exactly happening and again who your medical team is. You can’t transform your medical team just because we want to save a leg. People are kind of set in their ways and everybody tends to learn very slowly, which is good. It’s healthy. So people don’t get into too much trouble trying to do things they are unfamiliar with. Rene: Right. Limb sparing is one of those things that we don’t hear a lot about here. But I understand we have some members in Germany who said over in Germany, they’re doing it quite a bit. Is that true? Dr. M-L: I think we’re doing it more in the US than in Germany. But it’s done very – generally by very sophisticated groups. The one that comes to mind is Colorado State University Cancer Center there. They do limb sparing. They have been doing limb sparing and a number of other programs do it around the country. Florida maybe comes to mind as another one. 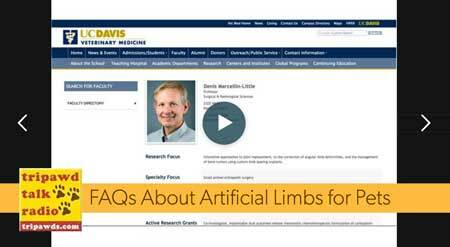 Other universities have the means and the knowledge to do it, including UC Davis here. But again, screening the patient and determining whether the dog is a candidate is very critical and multifactorial. It’s not something you can decide by looking at your dog in the eye. It’s something you have to – you have to be staging the tumor and looking at local invasiveness and bone invasiveness. It usually requires good CT scanning. Maybe a bone scan and again the surgical team has to be trained to do so. So it’s still a very limited and sophisticated and multidisciplinary process that’s not going to be available to everybody. Rene: Yeah, that’s unfortunate at this point. But maybe eventually – what about for those animals that are good candidates for an external prosthetic limb? What is the rehab like? How does that work and what kind of commitment is required of the person and the animal to get through it? Is it an ongoing thing? Will they always need rehab or is it just until they adapt? Dr. M-L: The success is very – very little is known if you want from the scientific literature about why prosthesis would work or not work. But generally, they have to be very stable and we tend to look at them – you know, you mentioned a child 3D printing a little device. Training a dog to use the prosthesis is about as complex as it gets in orthopedics and so – and appreciating the stability of a device or the lack of stability of a device is also a very sophisticated task. So we can – devices are going to be used successfully if they are well-designed, well-structured and connected kind of very – in stable fashion to the leg itself. You can’t just do a shell and try to reinvent the wheel and hope to get lucky. You won’t get lucky. You have to have something that is stable in all directions and that requires kind of solid, maybe mechanical knowledge if you want. It’s like repairing a fracture if you want. It’s very similar to that. Then beyond that, when the leg is placed in a device, the dog generally considers the device like a foreign thing and we will tend to have to train these dogs. Maybe like a dog that’s recovering from a big surgery. So it requires kind of spine rehabilitation to eliminate the tendency not to use the device and we call it disuse. Basically dogs have kind of limb disuse. They don’t use their legs spontaneously in many situations. So we have to do a bit of a complex rehab also in some dogs. If the device is stable and there is enough limb left, sometimes dogs will spontaneously use that device pretty much immediately and so then we don’t have to do a lot of rehab. Some dogs require more rehab. It’s a little bit unpredictable. But generally, with proper design and proper feeding and adjustment, fine-tuning the device, feet and the leg, we can be successful pretty quickly. Rene: That is very hopeful. I like hearing that. I would like to find out from you – you talked about how – you know, the right kinds of prosthetics need to be made in order to be successful. But who are the people best qualified to make one of these devices? I know they’re popping up all over the place and I’m just wondering. Is there a list of criteria that we can refer to? What should we look for if we want to look at this as an option? Dr. M-L: I think you would want to look for past success, I think. That would be important since the field is so uncharted. So there are professional companies with more experience. They don’t always behave or plan or execute things the same way. Every company is kind of set in their ways. It’s always in your best interest to find somebody local but that has experience and that’s not always an option. So you could say, well, we have remote places in different states that might be an option. But generally, that’s not ideal because it’s hard to do the feeding. Your veterinarian has to be the interface maybe, but not every veterinarian is very excited about trying to fine-tune things or train dogs to use them. It’s really an unusual task for most veterinarians and not one they look forward to be doing. So I think a local prosthesis would be a good thing to have. It’s not always easy to find. So maybe seeking remote advice would be – building a library of resources such as – I think we should collaborate together on assembling some resources that your members can read and educate themselves. The more educated they are, the less frustrated they will be and the more effective the process can be and the more efficient. Often decisions about prosthesis have to be made very quickly and so people should maybe either learn ahead of time or learn quickly, so they make good decisions about what they can do in their own states or in their own local environment. Rene: Yeah. We are definitely working on building that information. What about people who design human prosthetic limbs? Is there a crossover? Can they successfully develop one for animals too or should you – is there any kind of certification for the veterinary prosthetics designers? I mean I know there’s a lot of human prosthetic designer who were doing them for animals. Is that a good thing? Dr. M-L: It’s not a bad thing because they have high standards of – usually they are very well-trained. So it’s like – like what happened in physical therapy in the field of human physical therapy when it kind of opened up 20 years ago towards vet met. You had veterinarians that knew pathology well but knew nothing about how to do rehab and you had physical therapists who knew very well how to do rehab but knew nothing about the pathology and the strength came from the two working together before people got trained in sports medicine and rehab on the vet side of things. There was no such thing and you had to kind of communicate with the other part. I think we are at that stage. We are 20 years behind in prosthetics where they are very, very few vets that would know how to design a device or even communicate with a prosthetist. But they don’t know what they need and so the prosthetist tends to take complete control. But they don’t understand biomechanics and limb use and gait as well as they should. So potentially they might be doing things that are a little bit suboptimal if you want. So working with a company that already had success and experience and has made mistakes already is going to be in your best interest or assembling a team that has a veterinarians that is well-versed with rehabilitation for example and orthopedics, combined with the prosthetist, that gives you the best chance for success. The field does not have certification for veterinary prosthetics. It’s a small universe as you can imagine. So it’s not the number one thing on the priority list. But it’s being discussed. Not the certification, but the theme is being discussed often enough and it’s needed enough that it’s bound to get more popular in the future and more formalized and hopefully, we get more research also in the future. Rene: Oh, thank you for explaining that. That’s a really good comparison. I appreciate that between the rehab and the prosthetics. That’s perfect. I have taken up so much of your time today, doctor. I really, really appreciate it. I can’t believe 30 minutes has just gone by. We’re actually over 30 minutes. So I hear your buzzer going off and I want to let you get back to work. But do you have any final thoughts about the technologies you’re working with and what we might expect in the future? Dr. M-L: Yeah. I think things are moving in the right direction. We shouldn’t be frustrated by the fact that things are evolving maybe too slowly. So I think we just – as a dog owner, everybody should have high standards and ask a lot of questions and if your gut feeling is that that leg should be saved and you need to fight to save that leg and never be shy about reaching out at somebody far away to have a discussion about it, make pictures, share. You know, fight for what you believe might be a right thing and listen to the advice that you get and hopefully amputations are going to become a little bit – managed a bit differently in the future. Rene: Oh, I hope so too. Thank you so much, doctor. Really, really appreciate all of your wonderful advice and we will have this up in our blog real soon. But thank you for your time today. Dr. M-L: I appreciate it very much and I hope to chat again. Jim: Yes, definitely. Thank you so much for your time, doctor. We can’t wait to share this information and listeners can learn more about the work you’re doing at VetMed.UCDavis.edu and find all past Tripawd Talk Radio podcasts at downloads.tripawds.com. Until next time, join the discussion about life on three legs for dogs and cats at Tripawds.com.